Please see my article Tribute To Our Predecessor" also. The Oldsmobile Toronado marked the return of front-wheel drive to the American automobile for the first time since the late 1930's and would unknowingly cause a design revolution that would sweep the U.S. auto industry. The personal-luxury coupe's styling was executed by GM design chief William L. Mitchell. Design features included jutting front fenders, rotating hidden headlamps, heavily flared wheel arches, and a Kamm Back rear. All of this combined with it's unique Front Wheel Drive would make the Toronado the winner of the 1966 Motor Trend Car of the Year Award. 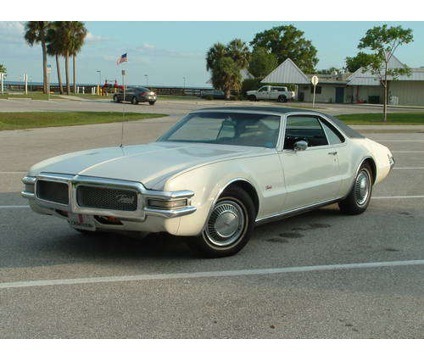 The Toronado received minor changes in 1967 which included a new egg crate grille and flush mounted headlight doors without that beautiful scoop-like gap at the top. The fascia sculpturing was now more subdued because of this change, and although it flowed better, it wasn't as nice as the '66. The Toronado received a few styling changes for 1968 which made it more different and more distinctive from it's first two years. A beefy chrome front bumper which surrounded the honey-combed grille had a narrow vertical section which split the grille in half and is typical for Oldsmobile after this year. It also wrapped around the outside of the fenders with parking and turn signal lights that served as sidemarkers. The headlamps where fixed but hidden by Grille-like covers. Many pictures show the 1968 with an attractive full length vinyl top which left a painted margin above and to the rear of the side windows. It was much nicer than what would come. Officially (I guess) the vinyl top became optional equipment in 1969. It covered the roof from side to side and had a definate line of demarcation along the bottom edge of the "C"-pillar. The "C"-pillar styling lost it's sleekness with this option in my opinion. It just wasn't right. The rear trunk area was also changed to a sloped design, more like the Riviera, abandoning the Kamm Back of the earlier years. 1970 was the last year of the 1st generation Toronados which featured covered headlamps. New this year was an available GT version of the Toronado. The Toronado GT featured a 455 V8 rated at 400 bhp, instead of the standard 375 bhp found in the base Toronado. In addition, the GT also had a special cam and torque converter which further helped acceleration times. Visually, the GT featured dual exhausts with a notched rear bumper, nugget gold metallic paint with black wheel arch pin-stripes and a GT hood badge. 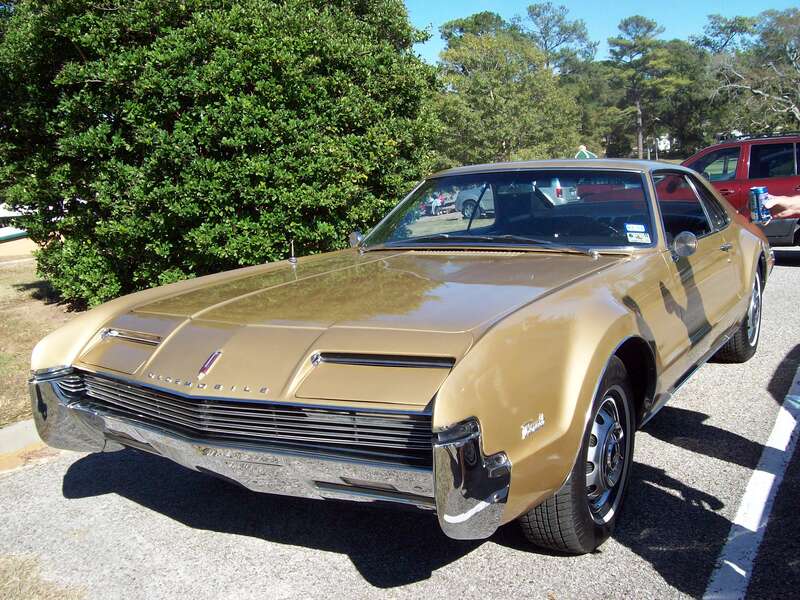 In 1971, the second generation Toronado was introduced and lasted until 1978. For this next incarnation, it, along with it's cousins the Riviera and Eldorado would be completely redesigned. Engineers settled on a 122.3-inch wheelbase, 3.3 inches longer than before, and both the full-frame chassis and "E" body would be all-new. The car was more luxurious and less sporty than the 1st generation model, but that wasn't new news as the car coninued to become less sporty after it's first year, with the exception of the GT. The bumpers were set lower in anticipation of the new regulations coming in 1974. Front and rear passenger car bumpers were now required by NHTSA to have uniform heights in 1974, take angle impacts, and sustain 5-mile-per-hour (8 km/h) impacts with no damage. From 1974 through 1976, it is also recognized as being one of the first vehicles to use high-mounted auxiliary brake lights, and Oldsmobile equipped the car with airbags, another safety innovation that was a first of it's kind. The XS was short lived however as Oldsmobile made room for our smaller Toronados in 1979. 79-85 GM-EBodies.org website by Mark Sabourin is licensed under a Creative Commons Attribution-NonCommercial-ShareAlike 3.0 Unported License.